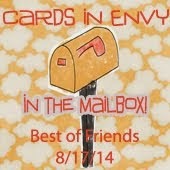 Cards, stamps, challenges...and support for our troops! Happy 9th Birthday Taylored Expressions! I used a gorgeous TE angel ( I think she is retired) and colored her with Copics and then put Crafter's Companion sparkle marker on her dress and wings- which does not show well in the picture. I embossed snowflakes and added distress oxide inks to a panel of watercolor paper. Oh...the oxides are so fun to play with and the colors are so much more vibrant in real life! A piece of vellum with silver swirls, some sequins, a TE sentiment and I was done! I changed some of the dimensions from the sketch so I could show more of the background paper and the vellum. Happy birthday to TE and thanks for the challenge...it helped get me back into creating!! I am still here but my creating time has been limited lately! I am on a mission to back into card making! I do want to share that I won a prize from Justine Hovey's one million You Tube views celebration! https://www.youtube.com/user/justinehovey/videos It is a great product- Amaze away.... this removes permanent marker- no matter how old! I am blown away by how great this works! I hope to be back soon with cards and to join in on a few challenges! 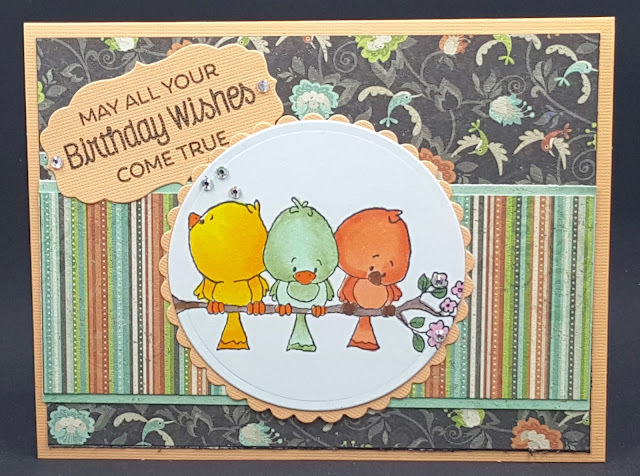 A new to me challenge blog- Retro Rubber- is based on a great idea--you have to use stamps at least 1 year old! 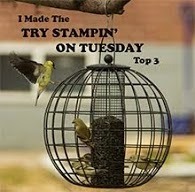 What a great motivator to bring out some loved but lonely stamps! The current challenge is to create a card with a critter. I paper pieced sections of the bunnies and colored a few sections with copics. And I just noticed I lost 2 of the Queen and Co rhinestones between creating and photographing....or I just missed putting them on- LOL. 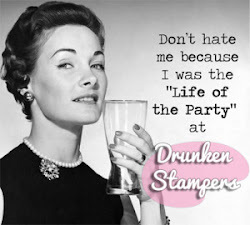 Stop by Retro Rubber-- there are some fabulous cards! 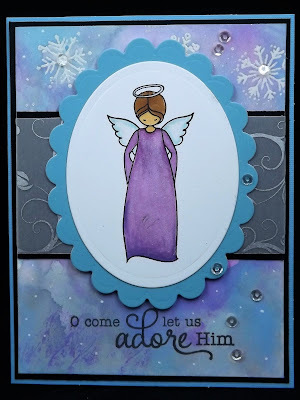 I used a great stamp set from My Favorite Things and the pink cardstock is also by MFT. And yes, I put Spectrum Noir Sparkle markers on her coat and the fire; it photographs funny...I love it in real life! this time around is to create a card featuring something with an F. I decided to use this very friendly Frosty snowman who is sending warm fuzzies! I paper pieced his hat and scarf and it is hard to see but the snow banks and the fur and pompom on his hat are glistening from Spectrum Noir glitter markers. I love the patterned paper- it looks like the snow is actually moving! Hello- I found my mojo and finally some time to color and create so this is my second post for today! 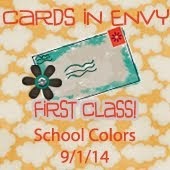 Over at Cards in Envy- the theme is wings. 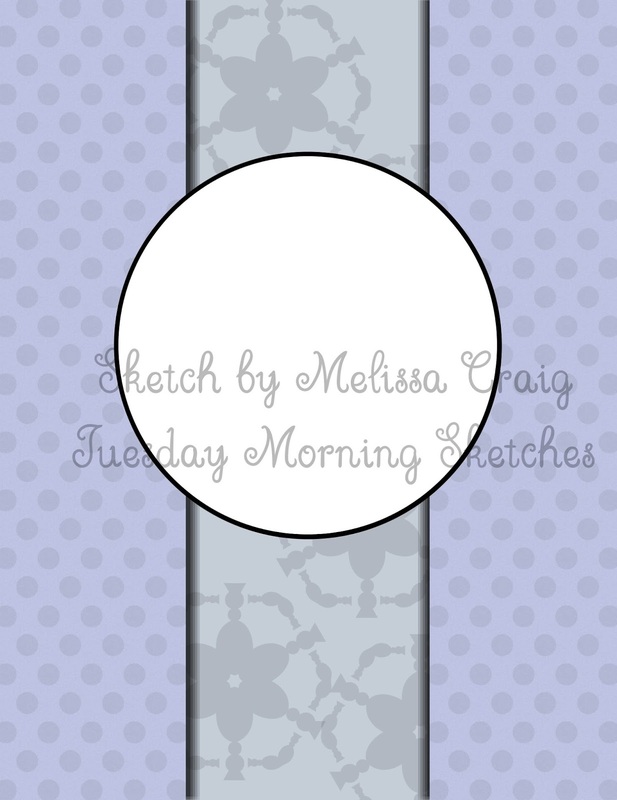 And Tuesday Morning Sketches has a classic sketch to try, I love when an image can take center stage! I rotated the sketch- but otherwise used it as is-- I love the crispness of the sketch!And the bird stamp by Whipper Snapper Designs is so stinkin cute- and one of my favorites! Rudolph the Red Nose Reindeer- A Challenge of RED! is to use red- a lots of it! How could I resist this happy Santa by My Favorite Things- colored with Copics and Spectrum Noir glitter markers on the belt, boots and beard! Oh I wish the shimmer showed in the photo...so shiny and cheerful!The areas that look white are glittery goodness! I colored white ribbon with 2 shades of red copics for my final touch of red. I chose red, green and gold for my colors-- and the cute elf's outfit comes across more as a blue/green instead of a true Christmas green. I just tried out a shotbox-- love it- but I think I need to practice more with the lighting! 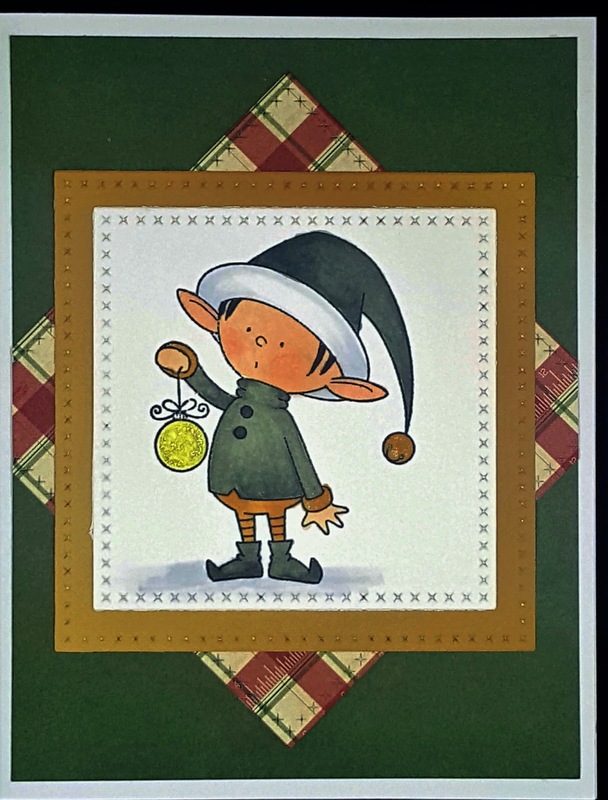 The elf stamp is from My Favorite Things- a wonderful set of stamps! I have been absent from blogland for a while. Life got super busy and my mother and father decided it was time to be together again. My mom passed in May after a sad struggle with Alzheimers. My comfort is knowing they are together again. I am off to the first tournament softball weekend of the season. The weather should be nice and in between games I plan to do some coloring of Christmas images. I hope to be posting more often. Happy Fall! I love the cooler air and the gorgeous colors of the leaves! Living in New England, I am so lucky to experience autumn in it's full glory! I used a Hero Arts stamp set and a bunch of different colors of memento dew drops ink pads. The large leaf in the background is from American Crafts and I just smooshed inks all over it. Thanks for stopping by and I hope your weather is enjoyable! 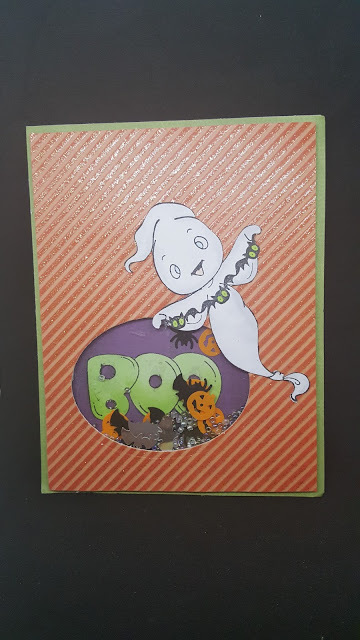 I have another shaker Halloween card- and this time the ghost is from the Booyah set by Lawn Fawn-- so stinking cute! There are stamps of hats, wigs and a variety of facial expressions so the ghosts can be dressed up to go Trick or Treating! I used a ship stamp from Simon Says Stamp and used white embossing powder--my thought was to make it look like a ghost ship....it just looks like a white ship-LOL. I also heat embossed the sentiment. The skull on the pirate hat is colored with a yellow glitter pen- so very cool in person. and Cards 4 Guyz is looking for cards with embossing http://cardz4guyz.blogspot.co.uk/2015/09/challenge-88-embossing-heat-or-dry.html. It has been a long time since I created a card--- and where did the summer go? 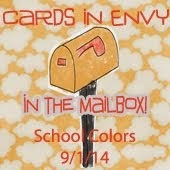 I felt like just yesterday I was packing my last batch of cards for OWH! 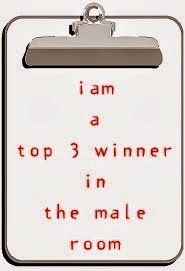 Today's card is for http://sendasmile4kidschallenge.blogspot.com/. The challenge is to create a fall or Halloween card- but not too scary! My ghost is a sweet, friendly ghost. 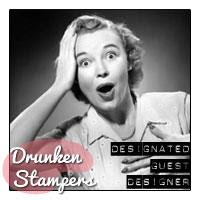 The stamps are from CC Designs by Amy Young-- oh how I wish she was still designing stamps!! I made a shaker card and put the sentiment inside the shaker. And yes, I kept shaking it...very fun! Thanks for stopping by and I am hoping to get back into my card making groove soon! The challenge at http://seizethebirthday.blogspot.ca/ is anything goes- as long as it is a birthday theme! Here is my first non- Operation Write Home card and it is for my niece Tessa. The Prima stamp is colored with Copics and I covered the balloon with a clear glaze pen- lots of shine but it dries quickly. And then I used a clear star glitter pen on her shoes, gifts and parts of her party dress (the ruffles do not show the shimmer but it is there!). I put the sentiment inside the card so the image can be the focus- she is a cutie- and quick to color. Welcome! 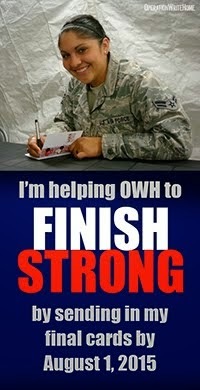 I have been blogging since November 2012 and sharing the cards I made for Operation Write Home- mission accomplished! I am blessed with amazing and loving people in my life. I appreciate you taking the time to visit! 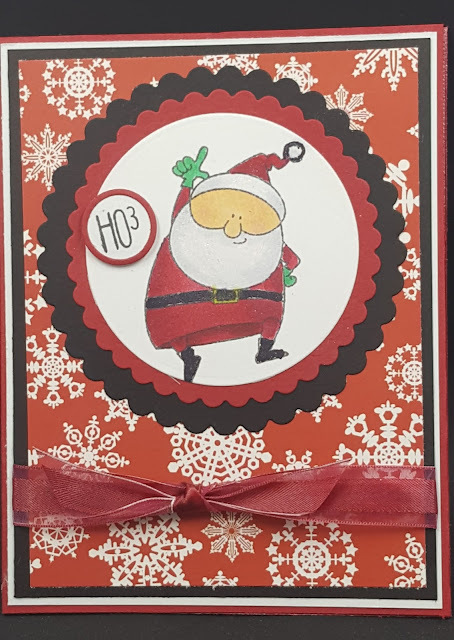 Holly Jolly Christmas Challenge Top 3! A Boston gal had to win a weather challenge after the winter of 2015! 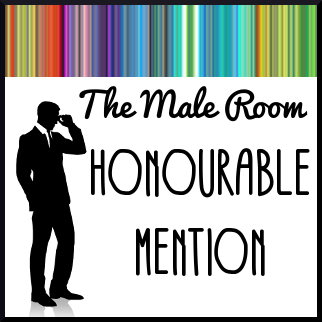 Love the Cards in Envy Challenges! 6/11/13...again! Don't you wish I came to all your parties?